MCLEAN, Va., Dec. 16 /CSRwire/ - As part of Capital One’s ongoing efforts to help students develop a greater interest in Science, Technology, Engineering and Mathematics (STEM), Capital One hosted a closing event for the Capital One C1 Coders program in McLean, VA, on Thursday, December 15th. 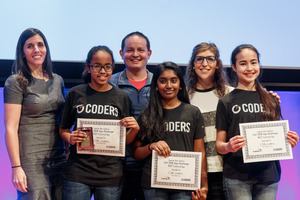 For the past 10 weeks, 1,000 sixth-, seventh- and eighth-grade students across the country have been learning about software engineering alongside Capital One associates, with the final project of developing their own unique apps using MIT University’s App Inventor 2. At the graduation event, Fairfax County Public School students demoed apps they created during the 10-week curriculum. Mayim Bialik, actress and neuroscientist, addressed the crowd by talking about her personal experience of discovering a passion for science, the importance of STEM and celebrating the students’ achievements. Capital One surprised 90 students with free laptops to encourage them to continue their learning. Capital One Financial Corporation, headquartered in McLean, Virginia, is a Fortune 500 company with branch locations primarily in New York, New Jersey, Texas, Louisiana, Maryland, Virginia, and the District of Columbia. Its subsidiaries, Capital One, N.A. and Capital One Bank (USA), N. A., offer a broad spectrum of financial products and services to consumers, small businesses and commercial clients. As part of its ongoing commitment to communities across the country, Capital One recently launched the Future Edge, a $150 million commitment to empower more Americans to succeed in a digitally-driven economy through community grants and initiatives over the next five years. To learn more about Future Edge and other Capital One initiatives please visit www.capitaloneinvestingforgood.com or @YourFutureEdge.